When it comes to creativity Biafrans would never be left behind. They are so talented that their presence or their hardwork is felt all over the world. Aside from graduating in flying colors in top universities abroad, some Biafrans have found their calling and try as much as possible to achieve something great from the special gift given to them by God. Such was the case of this talented young man, whose pictures has been going round on social media for constructing a robot. 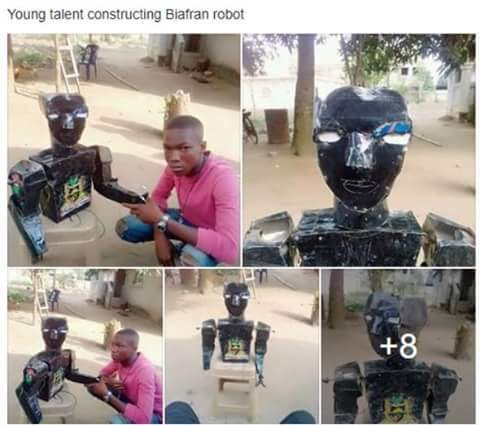 His pictures were on Tuesday, May 1, shared on Facebook by Chinaza Ikonne on Radio Biafra London group with the caption: “Young talent constructing Biafran robot.